One of the big concerns through the northwest…Canada and Alaska…is bears getting at our food. As they say, “A fed bear is a dead bear.” If a bear connects humans with food it can easily translate into an attack. If that happens, the dead is hunted down and killed. 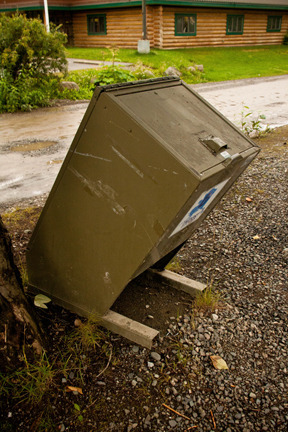 Almost everywhere, there are trash barrels designed to eliminate the bears ability to get at the trash. You have to unlatch the top to put trash in it. Obviously, bears can do that but maybe a raccoon? Since my last posting on Thursday when I was in Tok, I’ve left Alaska and traveled through part of the Yukon and into British Columbia. By the end of today, I’ll be in Alberta. 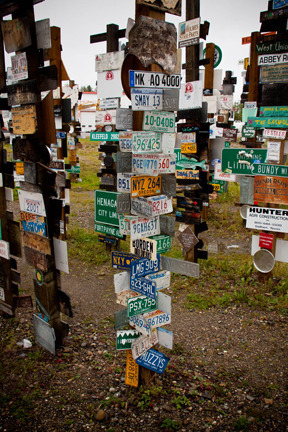 When I left Tok, I took the Top of the World Highway through Chicken to Dawson City. Chicken was originally going to be called Ptarmigen for the Alaska state bird but no one knew how to spell it so they said it tasted like chicken so let’s call it “Chicken”. I don’t know if the story is true but it’s told by everyone throughout Alaska. One lady clerk at a gift store told me that’s what she had been told for 40 years. 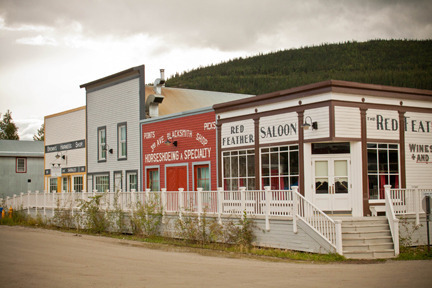 Dawson City is a unique town. As you approach the town on the highway, the road ends and you have to take the ferry about ten minutes across the river to town. The ferry carries 2-3 motorhomes and a couple of cars per trip. I had about a twenty minute wait and I was in town. Town is kind of a throw back to the Klondike days. I took some pictures, grabbed a sandwich, and headed south. 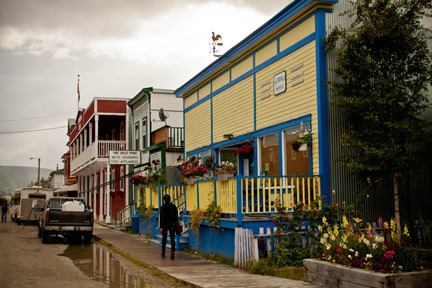 It seemed a little more authentic that Skagway but cruise ships don’t come here. Tour buses from the cruise lines do. I arrived in Watson Lake on the Yukon-BC border about 8:30pm Thursday night. I had been thinking that I’d like to get some bison pictures and was going over a brochure I’d picked up at the visitor’s center earlier in the day. It looked like the best place was at MacKenzie River Bison Sanctuary. 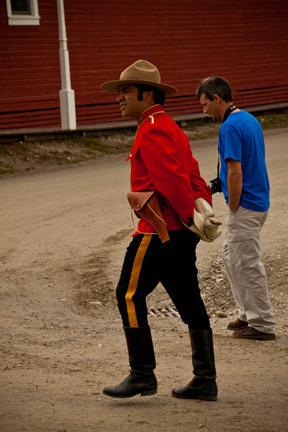 It’s in the Northwest Territories near Yellowknife. The tourist office in Watson Lake was closed when I got in. I stopped at the Northern Lights Centre across the street which was still open. Two high school boys manning the gift store there took me into the office and we looked up MacKenzie River and found it would take about 23 hours from Watson Lake. One of the guys said you could do that or you could drive down the road about 20 minutes and you’ll see a herd of them. Let’s see 23 HOURS or 20 MINUTES. I decided to spend the night and start out the next morning to hunt bison. Plus there was something else in town I wanted to photograph. It’s the Sign Post Forest. 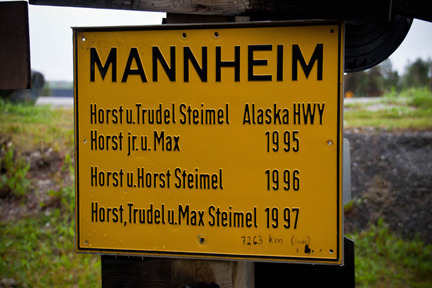 In 1942 a homesick U.S. Army soldier from Danville, Ohio was here working on the Alaska Highway. He put up a sign pointing the way to his hometown with the mileage. Others followed his lead. 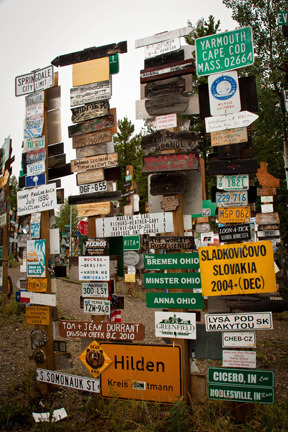 In 1990, another Ohio couple put up the 10,000th sign. 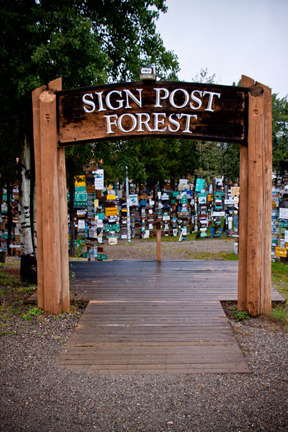 In 1992, the original soldier came back to celebrate the 50th anniversary of the Sign Post Forest. 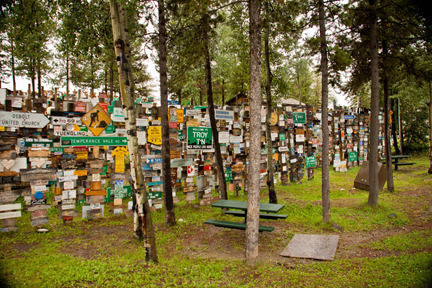 A lady in the visitor’s center told me that today there are more than 73,000 signs! Some have made several trips. Now, to find those buffalo….